Yarn Type SALE 20% OFF! 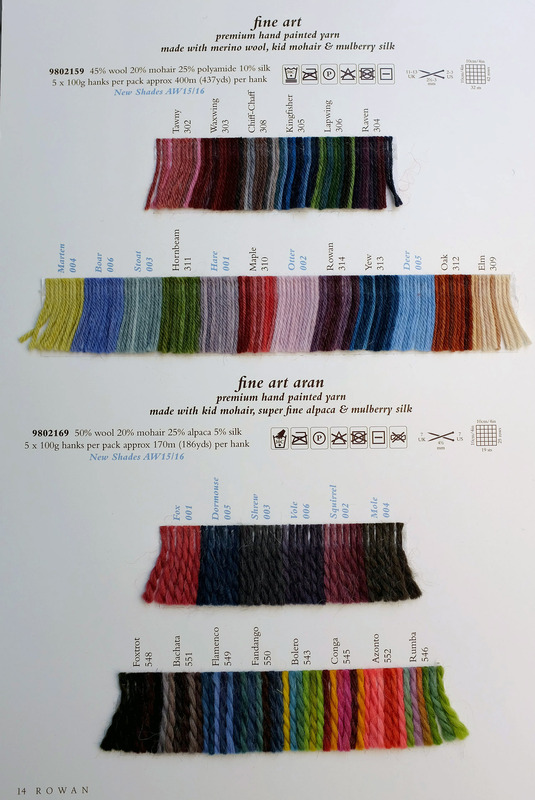 A luxury blend of merino wool, kid mohair, alpaca and mulberry silk and like the other yarns in the Fine Art family is hand painted with a blend of colours to achieve its unique colour effect. 20% Mohair, 50% Wool, 25% Alpaca 5% Silk. Hand Wash warm. 13 designs by Martin Storey for both men and women, using Super Fine Merino Aran and Fine Art Aran. Inspired by the colours and textures of the Yorkshire landscape, this collection has it all for a stroll in the countryside. Youll find the perfect sweater or cardigan you need to hit the hills or for exploring the beauty of Yorkshire and its pretty market towns. 8 designs by Sarah Hatton using Fine Art Aran. Fine Art Aran is a colour effect yarn so it is ideal for a Simple Shapes collections, letting the hand painted colour blends shine through and allowing the unique colour to be shown off . This soft aran weight yarn is ideal for the sweaters, simple cardigans and simple stitch detail garments, that Sarah Hatton has designed. These 8 designs are in easy to wear shapes and the relaxed fit means this collection has something for everyone. 8 designs for women from the Rowan archive reknitted in Rowan Fine Art Aran. All designs by Kim Hargreaves & Martin Storey. Fine Art Aran is a luxury blend of merino wool, kid mohair, alpaca and mulberry silk and like the other yarns in the Fine Art family is hand painted with a blend of colours to achieve its unique colour effect.